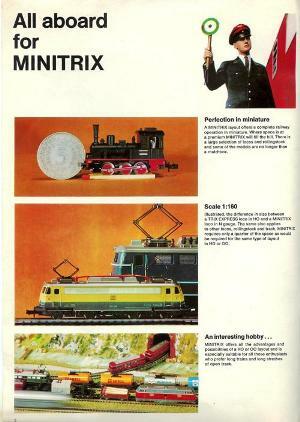 By 1968, the Minitrix catalog had exploded; there were numerous new items and, in comparison, new items had been added since the 1965 catalog had been issued. 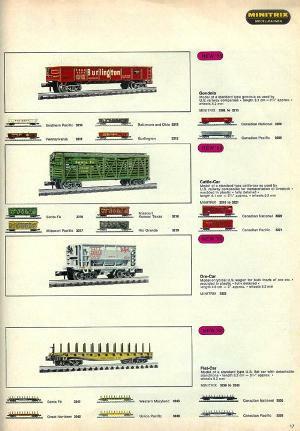 In addition, new North American prototypes were also introduced. 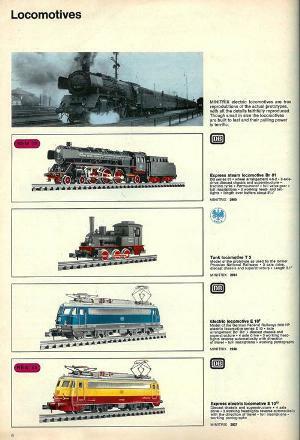 Likewise, the 1968 catalog was more ambitious, with additional informational segments and photographs of completed layouts. 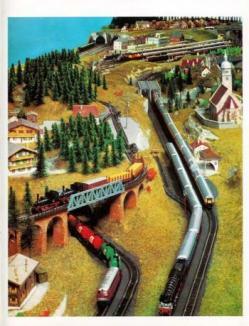 There were additional train sets. 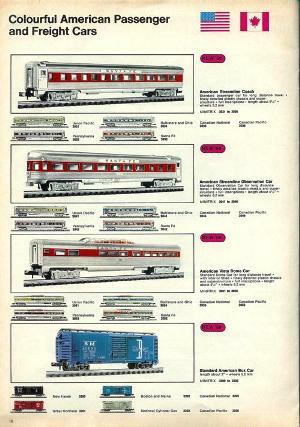 The Class E 10 appeared in new TEE livery. 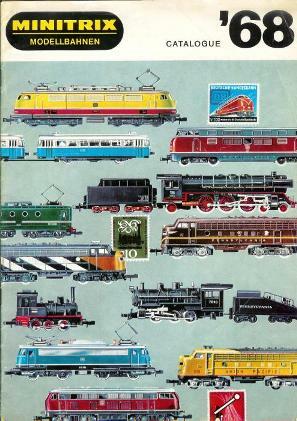 By 1968, the Minitrix Class E 03 was already present. 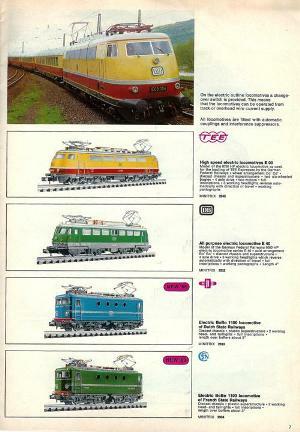 New that year were Dutch and French B-B Class 1100 locomotives, the same locomotive in two different liveries. 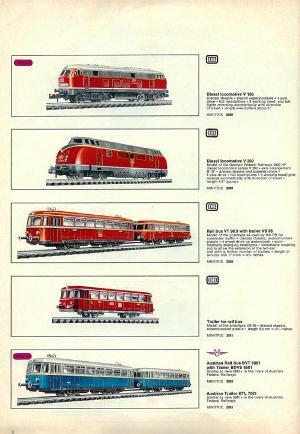 New in 1968 were both a V 160 and the rail bus in Austrian livery. 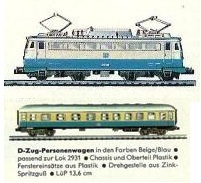 Like the Class E 03, the DB V200 was already present. 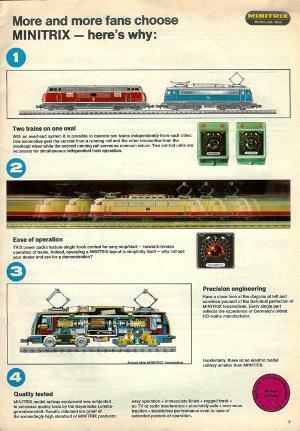 There also were TEE cars in the Minitrix product line. 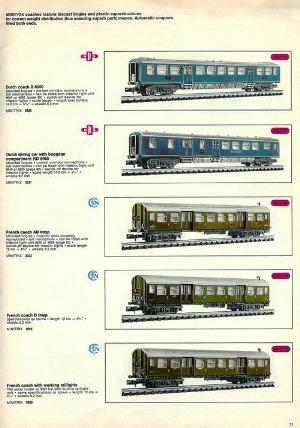 In addition to the TEE cars, a new express coach was added; it was a 13.6 cm long car while the other TEE cars measured 14.3 cm. 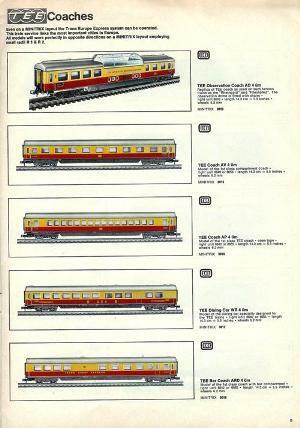 To accompany the Dutch and French Class 1100 locomotives, new passenger cars were added to the product line. 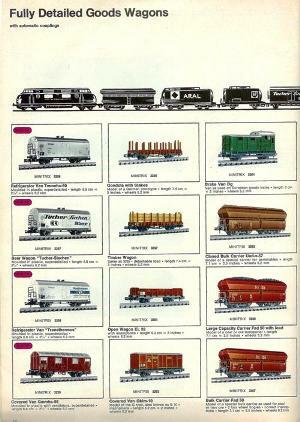 There were a few new freight cars in the Minitrix line. 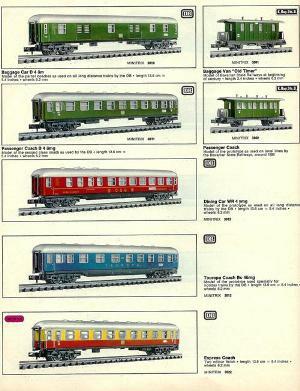 The 2931 Class E 10 and the 3014 Express coach in the blue & white Rheingold livery had disappeared from the Minitrix product line. 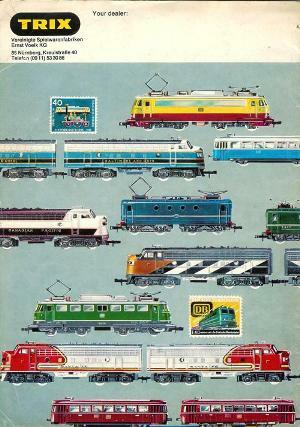 New in 1965, they were gone by 1968, arguably making them the rarest of Minitrix production. A full list of the Minitrix European items is shown here. 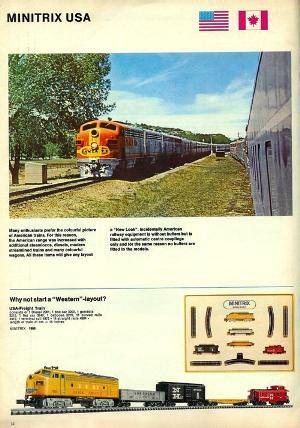 Also new in 1968 was a new line of North American locomotives and cars. 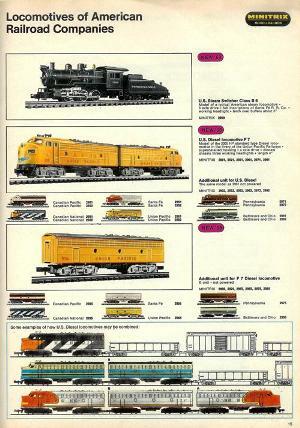 To go with the locomotives, there were both passenger and freight cars. 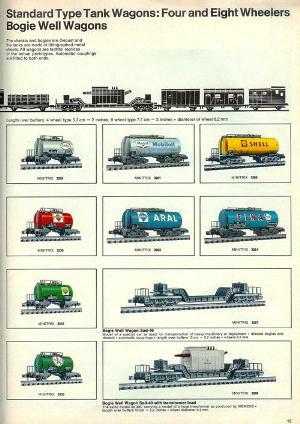 A full list of the North American prototypes introduced in 1968 is here. 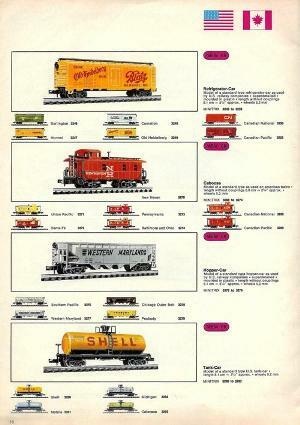 The 1968 Minitrix catalog also showed new wide radius curves, curved turnouts and long radius track switches. 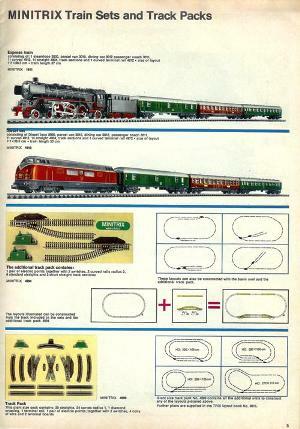 In all, it was an interesting year for Minitrix and for N-Scale in general. 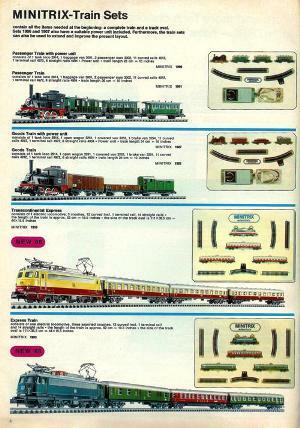 At this point, Trix was still identified as Vereinigte Spielwarenfabriken Ernst Voelk KG (Ernst Voelk United Toy Factories).